Please note that our dress code is in effect for the golf course and driving range. Anyone not meeting the dress code will need to change clothing to meet the dress code or be turned away. Men: Shirts must have a collar and sleeves. Mock neck shirts are okay. Women: Shirts must have a collar & sleeves or cap sleeves. Tailored pants, shorts and skirts are preferred and can be no higher than 4" above the knee. No metal spikes. Soft spiked golf shoes or runners only. Tank tops, muscle shirts, swim shorts and gym attire are NOT permitted. 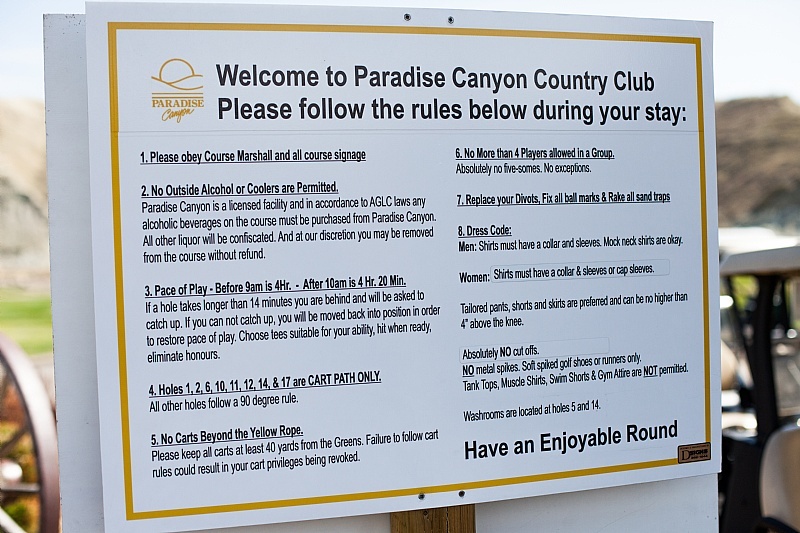 Paradise Canyon is also a licensed facility. Due to this, anyone who brings outside food / alcohol onto the course will have it confiscated and may be asked to leave.